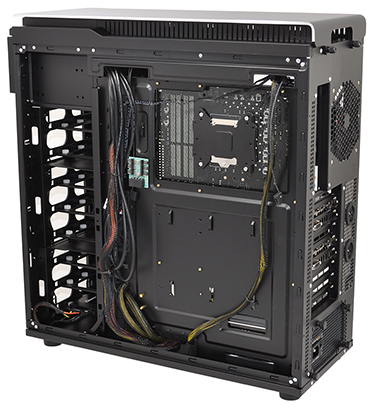 It wasn't that long ago that Antec chassis would have been high on the list of most users' candidates for a new PC build. Founded way back in 1986, the Californian manufacturer had amassed a wide range of well-received enclosures and when we asked our readers "which PC chassis do you use?" 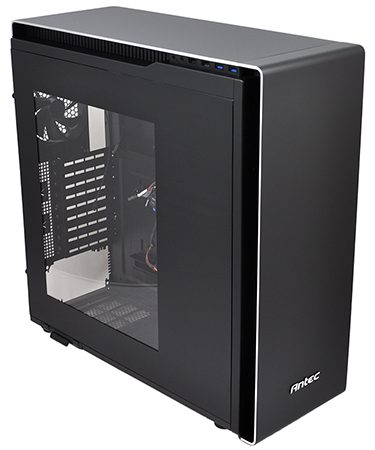 we weren't surprised to see a fair few still rocking an Antec case. But times have changed, and in this fiercely contested marketplace, the Antec brand doesn't hold the swagger it once did. 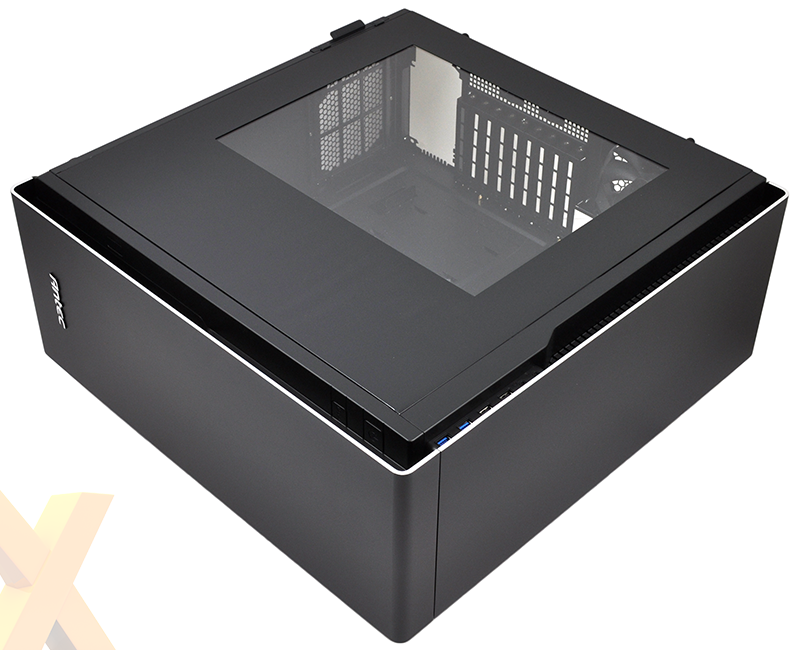 Facing stern competition from various newcomers such as Corsair, Fractal Design and NZXT, Antec has struggled to be noticed in the enthusiast space, and if you had to pick a moment for the downturn, you'd probably look back at 2011's LanBoy Air - a once-intriguing modular concept that never lived up to its potential. 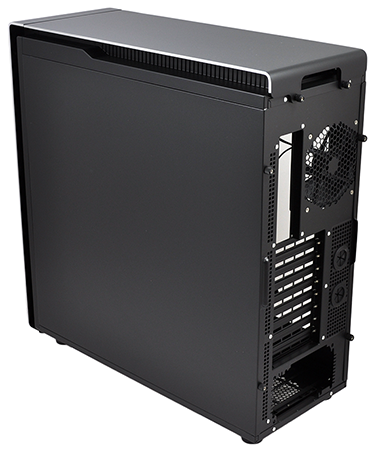 Still, it's a new day, and Antec is hoping for a return to form with a stylish high-end chassis dubbed the P380. Priced at £160, this premium full-tower solution is tasked with bringing Antec back to the fore, so let's see if it succeeds. First impressions are good and your eyes are immediately drawn to the 6mm-thick aluminium bezel that surrounds the chassis' top and front. The smooth lines of the metal give the whole case a premium and elegant look, and with many full-tower cases at this price point using liberal amounts of plastic, we like the fact that Antec's P380 offers a little more class. But here's the thing: look past the lure of the aluminium accents and you begin to discover some deeper flaws in the P380's make-up. Take, for example, the I/O ports and power/reset buttons. The former are tucked just beneath the top panel and can be reversed to face either left or right, while the latter are hidden behind the front bezel and mirrored on the chassis' left and right edges. It's a neat arrangement and one that leaves the sleek exterior unblemished, but it's a case of form over function as neither the I/O ports nor power buttons are particularly convenient to locate. And when you consider the chassis' hulking size - 555mm (H) x 224mm (W) x 557mm (D) - it's somewhat strange to discover that Antec couldn't find a way of implementing support for regular 5.25in optical drives. Instead, and in an effort to maintain the overall aesthetic, a plastic tray for a slimline optical drive is included in the bundle. This can be inserted behind the front bezel for side-loaded access, however support for only a slimline drive seems an unnecessary limitation. 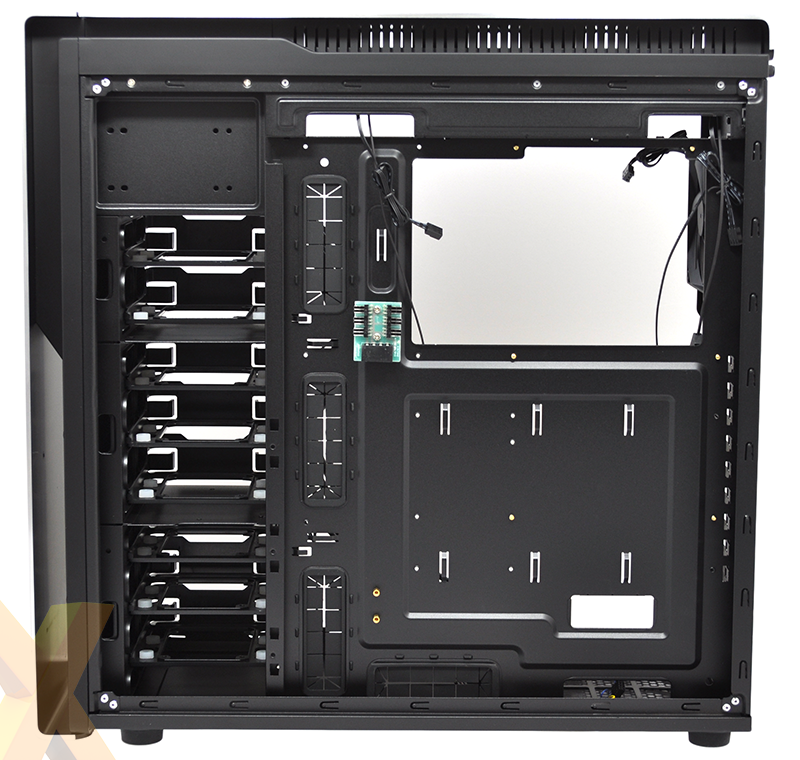 So determined is Antec not to interrupt the aluminium exterior that there are no power or hard-disk activity LEDs. The P380 should be a thing of beauty but niggling issues detract from what the manufacturer is trying to achieve. It does look smart, there's no doubt about that, and the side-panel window does a good job of showing off your build, yet there are oddities that leave you scratching your head, such as all the bundled screws being lumped into one small bag and an instruction manual that's lacking in detail. Another example is the front bezel, which while appearing mighty attractive, could have been better implemented. Unlike most chassis, in which the front bezel pulls away with ease, the P380's aluminium fascia is held in place by eight screws of varying lengths, making it time consuming to remove. There's also a dust filter sat just inside, which while a nice addition, pulls out downwards - meaning you'd need to raise the case or lay it on its side to get access. On the plus side, the dedicated PSU filter pulls out neatly to the side, and both side panels are layered with a noise-dampening material. Removing the side panels entails undoing two simple thumbscrews a piece, and both are hinged as opposed to notched, so getting them back into place is straightforward. Step inside and it's more of the same, with the P380 managing to impress in some areas and disappoint in others. What enthusiasts will appreciate most is the amount of space that's available. 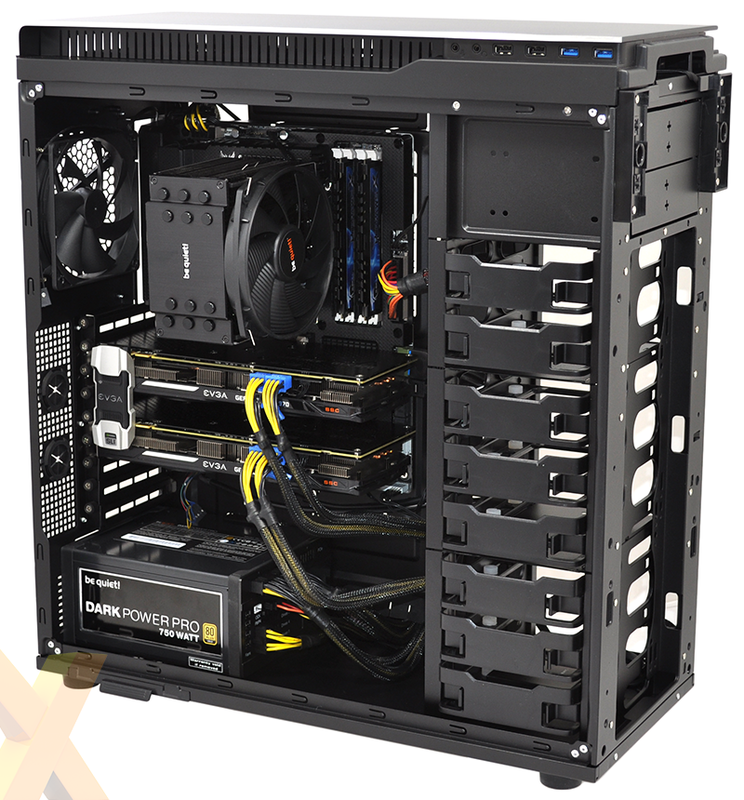 A wide range of motherboard form factors are supported - ranging right the way from Mini-ITX to E-ATX - and there are nine expansion slots to allow for more than just a couple of GPUs, each of which can measure up to 465mm in length. As you'd expect in a case of this size, there are fan mounts aplenty. The P380 offers seven in total, comprised of three 120mm mounts up front, three 120mm mounts up top and a 120mm mount for a rear exhaust. 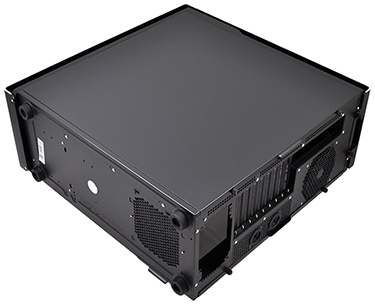 The front and top trio can alternatively be used for dual 140mm fans, and the configuration leaves plenty of scope for liquid cooling. Three fans are included in the out-the-box configuration, with Antec opting against dedicated intakes and favouring a single 120mm rear exhaust combined with dual 140mm top exhausts. All three fans have a toggle switch to alternative between low and high speeds (low is the default), and there's a basic Molex-powered fan hub attached to the rear of the motherboard tray allowing for up to six fans to be connected. Kind of useful, but the hub doesn't have the ability to control the speed of all connected fans, and the per-fan adjustment available to the bundled trio isn't ideal. In this day and age, you don't really want to have to venture inside the case just to change fan speed. At its most extreme, the P380 could house dual 360mm radiators, but getting there isn't quite as easy as it should have been due to a poorly thought-out storage column. 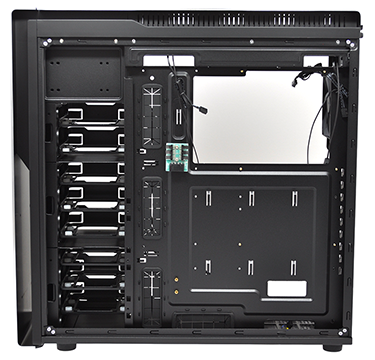 Antec divides this column into two 5.25in optical bays (which, remember, have no external access) and then three storage cages offering, in total, eight 2.5/3.5in drive bays. The plastic trays aren't tool-free but work well enough, however the implementation of the cages could have been better. Whereas most modern chassis offer modular cages that pull out after undoing a couple of thumbscrews, the P380's cages are held in place with a lot of small screws. 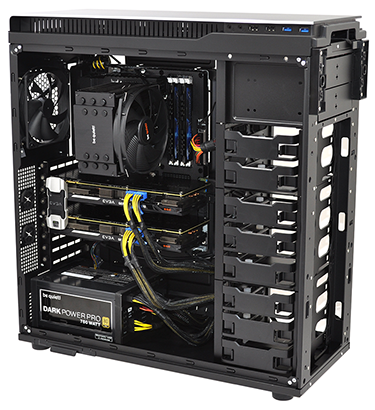 There must be 30-odd in total, and we're not sure why Antec has chosen to do it this way. If memory serves, the pre-release samples being exhibited at tradeshows last year had drive cages that were easily removed, making this final retail release feel like a backward step. 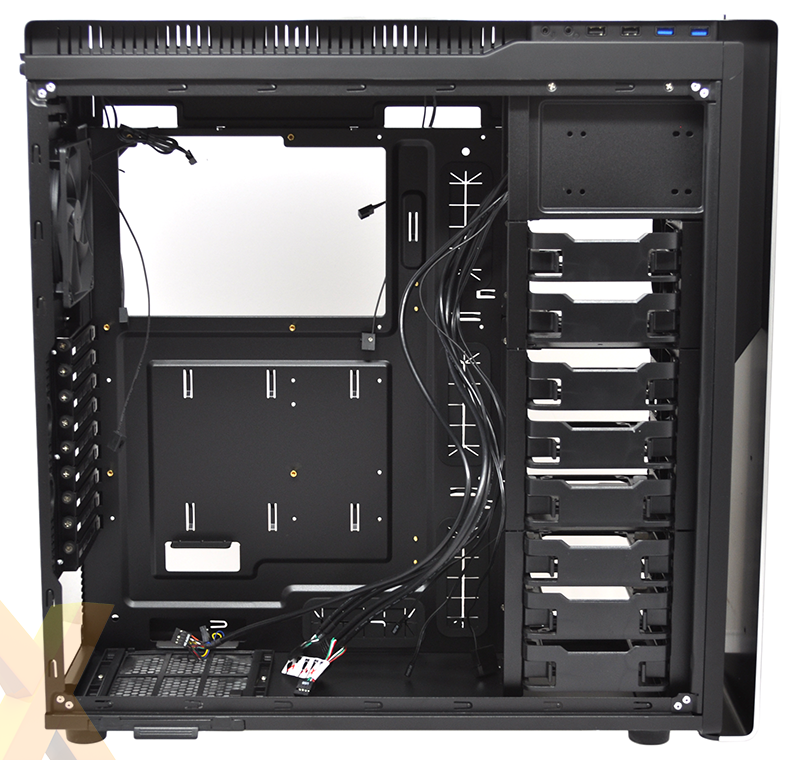 There are no dedicated SSD mounts behind the motherboard tray, so you will need to keep at least some part of the storage column intact, but you do get a good-sized cutout for CPU cooler installation and plenty of cable tie-down points. Cable management in general is reasonable, though the rubber grommets covering the holes do tend to slip out quite easily. Still, despite the various criticisms, our Z77 test platform does look smart when fully configured, and that seems to be the P380's primary goal. Let's now take a look at real-world performance.